The neck measurement is taken around the neck with the tape resting on your shoulders. You should put one finger between the tape and the neck if you want to allow for some extra room. The chest measurement is taken as a circumference measurement from one edge to the other edge. The waist measurement is taken as a circumference measurement around your mid section of the shirt. The hip measurement is taken as a circumference measurement around your hips at the widest part. Think of a line going from your armpit straight upwards to your shoulder. Measure between those two points and hold the tape measure straight. 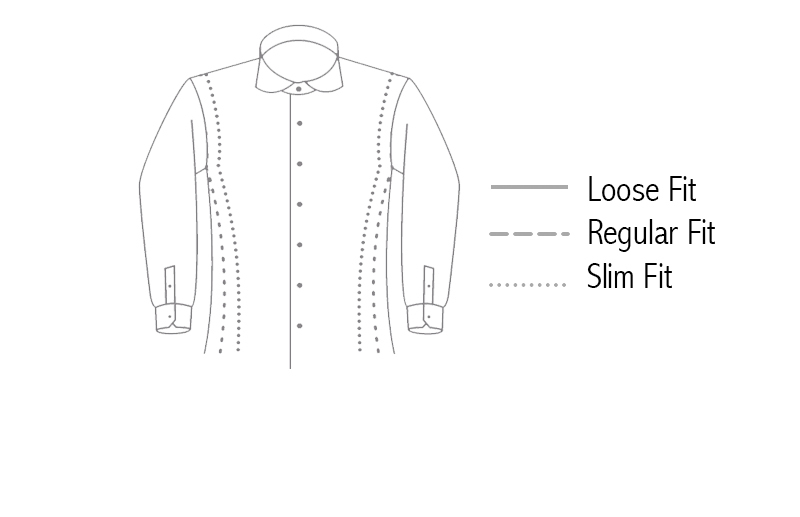 The shirt length measurement is taken from the top of the shoulder, close to the mid side of your neck, following your body down to the point where you want your shirt to end. The sleeve length measurement is taken from the point of your shoulder (where you took the shoulder width measurement), following your bent arm down to where you want the sleeve to end. NOTE 1! Bend your arm slightly when taking this measurement. NOTE 2! This measurement is always the full length of the arm. For short sleeve and 3/4 sleeve you should still measure the full length of the arm. The wrist measurement is taken as a circumference measurement around your wrist. NOTE ! We will add movement ease according to the cuff you select. System Saves each size profile against some email id only.